The new admin center reached general availability one month ago. This was a big milestone in our mission to provide you with a first-class admin experience, with tools that enable you to efficiently manage all aspects of the service. We continue to evolve the admin center. This month, we focused on providing you with additional usage insights, including new usage reports, the preview of the Office 365 adoption content pack in Power BI and more role-based permissions through a new Power BI admin role. In March, we launched the new reporting dashboard in the Office 365 admin center that makes it easier for you to efficiently monitor your service, identify issues, plan training and report back on the investment to your management. 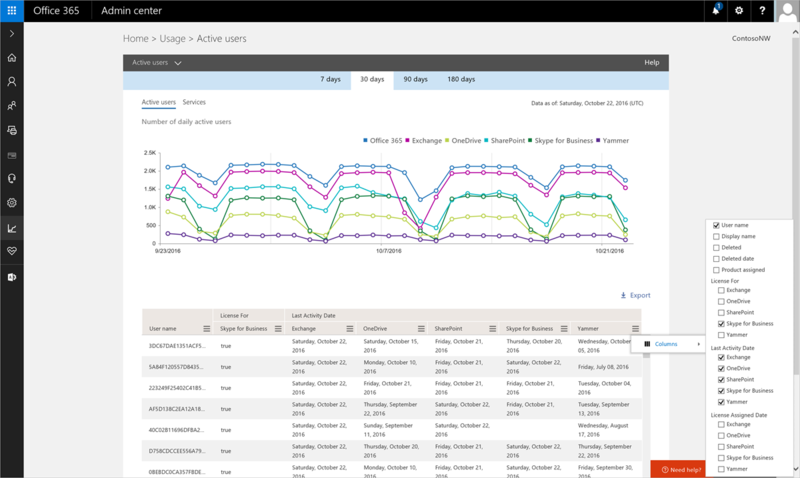 Today, we are happy to announce four new usage reports for active users, Email clients, Skype for Business clients and Office 365 Groups, that provide you with additional insights about how users in your organization are using and adopting Office 365. Active Users report—Lets you see which of your users actively use one or more of the different Office 365 services. This report is especially helpful for admins to identify users for whom they might want to plan some additional training and communication. Often, after being assigned an Office 365 license, users need a helping hand to get started with the different services. They might not know how to activate the product or how the product can help them to be more productive. The image below shows all users that are licensed for one or more products and the last date they used any of those products. By clicking the Column icon, admins can modify the table to see which license has been assigned to a user, as well as when the license was assigned to the user. Skype for Business clients used report—Shows the devices on which users have installed the Skype for Business app and whether they are using those apps for instant messaging or meetings. 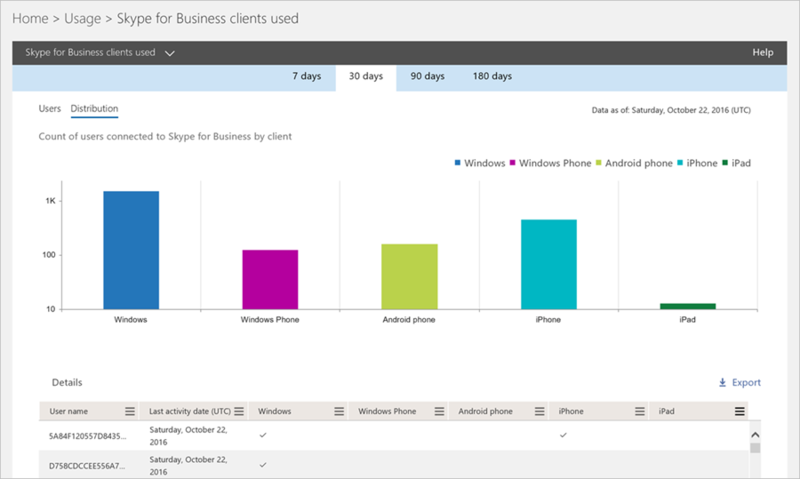 The report includes both Windows devices and mobile devices and makes it easy for you to see which device types are most commonly used by your users to connect to Skype for Business. Email clients used report—Provides information about which apps are used to connect to Exchange, including information about the specific Outlook version. Office 365 Groups activity report—Office 365 Groups is a service that provides a single identity for teams in Office 365 and equips them with a set of group collaboration assets, such as a shared calendar, notebook, project planning tool, as well as conversations powered by Outlook or Yammer. 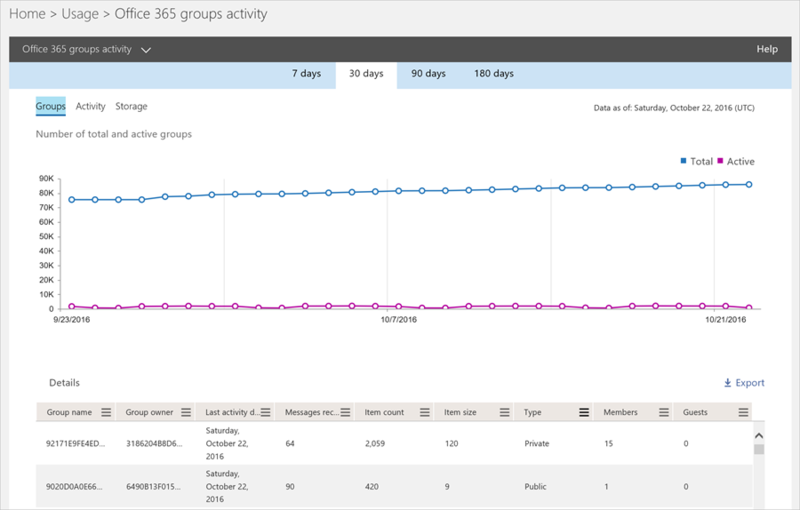 The Office 365 Groups activity report helps you understand how groups facilitate collaboration across your organization by surfacing information about which groups are active, how many members and guests they have, and how they are being used. The report is currently based on email activity and will be enhanced by other group activities in the future, including SharePoint Group Sites and Yammer Groups. You can find more information about the usage reports in the related support article. To provide you with richer and more personalized usage insights, we’re combining the intelligence of the usage reports with the interactive reporting capabilities of Power BI. The new Office 365 adoption content pack lets you visualize and analyze Office 365 usage data, create custom reports to share the insights within your organization and pivot by attributes such as location and department. The adoption content pack will become available for all customers to opt-in in the coming months. The new Power BI Service Administrator role can be assigned to users who should have access to the Power BI Admin Portal without also granting them other Office 365 administrative access. 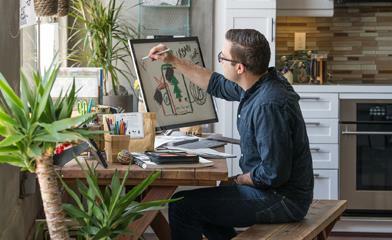 The Power BI Service Administrator role can currently be assigned through PowerShell and will come to the Office 365 admin center by the end of the year. In the coming months, we will add more reports focused on Yammer Groups and clients used to access SharePoint, OneDrive for Business and Yammer. We are also working on providing new public APIs that will enable you to programmatically access the usage data and integrate it into custom applications, like a company reporting portal. The new service health dashboard—announced at Ignite—will start to roll out to First Release customers mid-November. Try the new features and provide feedback using the feedback link in the lower right corner of the admin center. And don’t be surprised if we respond to your feedback. We truly read every piece of feedback that we receive to make sure the Office 365 administration experience meets your needs. Please note: the features mentioned in this blog post have started to roll out. If they are not available yet in your region, for your subscription, or for your organization, please check back in a few weeks!